Buying an engagement ring can be an overwhelming task. There’s a lot of pressure on this purchase. It’s a symbol of your love for your girlfriend, and it’s a token of your willingness to take the relationship to the next level. Plus, it doesn’t help that your fiance will be showing off the ring to her friends and family. For many men, the purchase of their lady’s engagement ring will be their first experience in the the wild world of jewelry. When they walk into a jewelry store they’re inundated with terms and concepts that they’ve never heard before. Tiffany setting? Inclusions? Eternity band? What the wha? Never fear. We’ve put together the ultimate guide to help you purchase an engagement ring that your girlfriend will flip over. Let’s get started. First thing you’ll need to do before you step into a jewelry store is establish a budget. It will help the jeweler show you options that are in your price range. Keep in mind that like buying a car, the price of an engagement ring can often be negotiated. You may have heard that a man is supposed to spend 2 months salary on an engagement ring. This is crap. Hoping to cash in on retuning GI’s itch to get hitched, this “rule” was invented whole cloth as part of a crafty ad campaign by the DeBeers company during the 1940’s. But there’s nothing romantic about going into major debt. Buy the nicest ring that you can afford. In the end, it’s not the amount of money you spend on an engagement ring that matters, but rather the thought that goes into purchasing it. Many women would rather start your life together debt-free or use the money for a sweet honeymoon than have you blow all your savings on some rock. If you want to propose, don’t delay because you can’t afford a better ring. The ring is supposed to be a symbol of your love, and what does it say about your love that you’re willing to postpone your marriage to buy a better rock? A humble ring will be a memory of that hard-scrabble time when you two were young. You can always get her a nicer ring for an anniversary present somewhere down the line. The jeweler I talked to noted that he’s been seeing more and more men coming in with their girlfriends to pick out a ring. While letting your wife-to-be pick out the ring she wants will ensure that the ring fits and that she likes it, you’re denying yourself a once-in-a-lifetime opportunity to show how thoughtful and romantic you are. Imagine the look of surprise your girlfriend will have when 1) you propose to her, 2) the ring fits, and 3) the ring you picked is exactly what she wanted. If you can successfully pull off this trifecta of surprises, you will be the subject of envious conversations among your girlfriend’s social circle, your future mother-in-law will say you’re a catch, and men around you will silently acknowledge your achievement. Making the engagement ring a surprise will take some work, but it’s well worth the investment. This is not to say that surprising her is the only way to go. Some women will insist that they go along with you to pick out the ring. If you’re like me, your wife will already have the engagement ring she wants in her possession. It was an heirloom from her great-grandmother. I just had to pick the ring up from her mom’s house. Just do what you and your girlfriend think is best. This where a lot of men screw up in the purchasing process. They’ll have the perfect ring picked out, but they get the wrong size ring for their girlfriend’s finger. When they get down on one knee and attempt to slide the ring on their lady’s finger, it doesn’t fit and awkwardness ensues. If you get the wrong size ring, all isn’t lost. You’ll just have to take the ring back to the jeweler and fork over some more money to get it properly fitted. But it’s best to avoid the cost and the potential embarrassment at proposing time by making sure the ring you pick is the right size. The best way to get your girlfriend’s ring size is to get a ring that she isn’t wearing and bring it to the jeweler to be measured. If you want to maintain the surprise factor, you’ll have to be sneaky about this. Swipe a ring from her jewelry box while she’s getting ready in the bathroom or recruit one of her friends to pocket a ring while she’s over her house. Try to swipe a ring that you don’t see her wearing very much; she’ll be less likely to notice its absence. You want to pick a ring that fits your woman’s unique style and preferences. Getting a ring that she’s over the moon for will score you romance points that will last a lifetime. Again, because of the clandestine nature of the engagement proposal, you’re going to have to harness your inner James Bond for this style reconnaissance. When you’re with your girlfriend, take note of the type of jewelry she wears. Does she wear a lot of gold? Maybe she’s a silver or platinum woman. Perhaps there’s a particular stone she wears a lot, like her birthstone, that she’d like more than a diamond. Does she like simple, understated pieces? Or does she favor the big, glitzy variety? Think about her personality; is she an outgoing girl who you know is going to want to show off her ring to everyone she meets? Then go for something big and sparkly. Is she an earthy woman, who doesn’t wear much jewelry at all? Look for rings that are simple, yet beautiful. Another way to get a feel for her engagement ring preferences is to take her right into a jewelry store. The key to this is to go under another pretext. Tell her you need to go to the mall to look for some new shoes and that you’d like her to come along. When you’re walking to the department store, go past a Helzberg Jewelry store and say, “Hey, I want to stop and look at some watches.” While you’re busy pretending to be interested in the Omegas, dimes to donuts your gal will be looking at the rings. Look at what she’s gazing at. Make a mental note of it. Say something casual like, “That’s a nice one,” and gage her reaction. Go back to looking at watches. Leave. Mission accomplished. 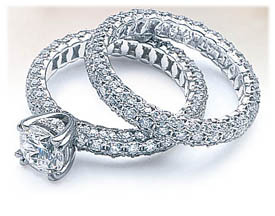 You have a variety of metals to choose from for the engagement ring’s band. The most common include yellow gold, rose gold, white gold, platinum, and silver. You can even do a mix of different types of metals. Each metal has their advantage and disadvantages. For example, platinum is an extremely durable metal and will last a long time. However, it dulls much more quickly than gold, and it’s harder to bring back the initial luster it once had. Gold, on the other hand, is shinier than platinum, and because it’s a soft metal, it’s easier to buff and polish it to get back the ring’s original luster. Gold’s advantage over platinum is also its weakness. Because it’s a soft metal, gold wears down faster. In about 15 to 20 years, the engagement ring may have to be reshanked because it’s worn too thin. While you may be interested in the durability of the engagement ring band, your future wife is probably more interested in the way it looks. Right now, silver-looking engagement rings are the most popular. 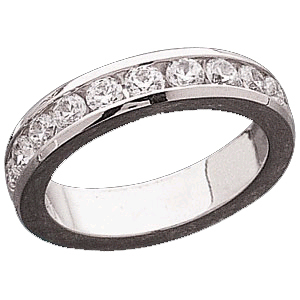 If your lady is a woman who stays on top of the latest fashion trends, go with a platinum or white gold band. If she’s more of a classic type of gal, go with the traditional yellow gold band. So you’ve selected a band. We now move to the focal point of most engagement rings: the diamond. For many men, purchasing a diamond can seem like a daunting task, but with a bit of knowledge, you can walk out of a jewelry store with a stone your fiancee will be dying to show off to her friends. When selecting a diamond, you’ll want to take into account the “4 C’s:” cut, color, clarity, and carat weight. All four of these factors determine the quality and cost of the diamond. Cut. Cut doesn’t refer to the shape of the diamond, but rather the angles and proportions of the stone. 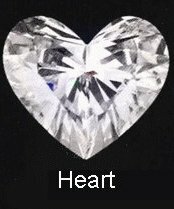 While nature determines the other three C’s, the diamond’s cut is determined by a cutter. A well cut diamond reflects light from one facet to another and projects the light through the top of the stone. This is what gives a diamond its sparkle. Diamonds that are cut too deep or too shallow leak light through the bottom or the side of the stone, resulting in a lackluster appearance. Out of all the four C’s, cut is the most important. Even if you have the perfect color, clarity, and carat, if the cut isn’t right, the diamond won’t have that fiery brilliance that your fianc? will show off to her friends. Color. To many men’s surprise, diamonds come in a variety of colors. Diamond color is graded on a scale that ranges from D (colorless) to Z (light yellow). 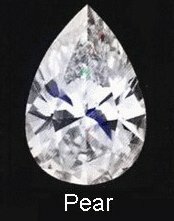 Truly colorless diamonds are the most rare and most expensive. White color diamonds are the most popular. But when it gets down to it, diamond color is all about preference. Look back at your notes from your ring reconnaissance to see what your lady prefers. Clarity. The fewer imperfections a diamond has, the more clear, and consequently, more expensive it is. When the jeweler starts discussing the clarity of the diamond, he or she will probably mention the diamond’s “inclusions.” Inclusions are other minerals or tiny fractures in the diamond. The fewer inclusions the better. Like color, clarity is measured on a scale. SI1 and SI2 are slightly included but you won’t be able to see the imperfection with the naked eye. Try to find a diamond in this range. 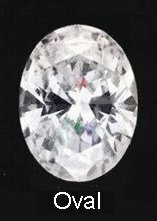 When looking at a diamond, avoid stones with inclusions on the top and in the middle, as this can impact the dispersion of light, making it less brilliant. Carat Weight. Carat refers to the weight of a diamond. The heavier the stone, the more you’re going to pay. However, there’s no need to get to caught up on the carat weight. Through proper mounting and shaping, a master jeweler can make a diamond appear larger than its carat weight might suggest. A round diamond is the classic and timeless diamond shape. 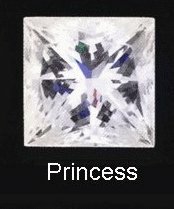 The Princess is a square diamond and is the most popular shape for engagement rings right now. A ring’s “setting” refers to the way in which the diamond is placed on the the ring. Like everything else with an engagement ring, which setting you pick depends a lot on your girlfriend’s preferences. You can actually create combinations of different settings if you want. Here’s a quick primer on the different types of settings, so you’re not completely clueless when you walk into the jewelry store. Introduced by the jewelry company that bears the name. It’s a timeless and classic look. 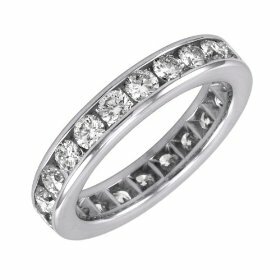 Instead of a single diamond, an eternity band has diamonds that go all around the ring. A metal rim that encircles the sides of the stone and extends slightly above it. The rim can stretch around the diamond’s entire circumference or around only a portion of it. A bezel setting holds a diamond securely, and the low, protective profile it creates makes a bezel setting a good choice for women with active lifestyles. In a channel setting, the diamond or diamonds are placed into a metal channel. It can be used as an accent to a main diamond that’s set on a prong. 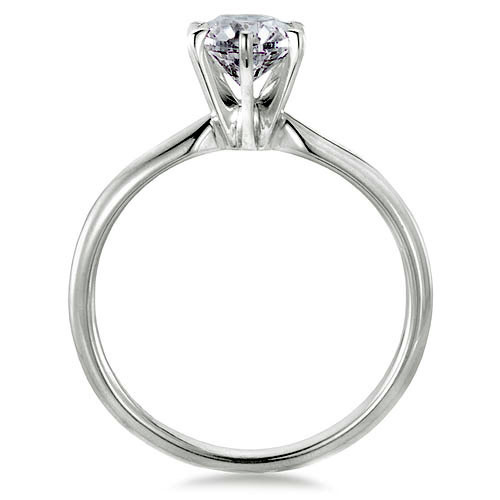 This setting consists of lots of diamonds placed close together. This entry was posted in Engagement rings, Wedding engagement rings and tagged Antique Engagement Rings, diamond engagement rings, diamond rings, emerald, engagement ring, marriage, perfect engagement ring, rings, Weddings on November 8, 2014 by admin. 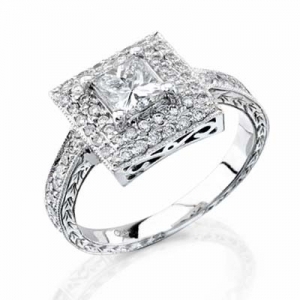 Platinum Engagement Ring Settings is something that each and every girl desires and wishes to have for the longest time, this is something that would adore having and would surely really feel like a princess once they show their engagement ring to their buddies. You’ll find qualities of platinum that made them really interested to utilize platinum and recommend them to their shoppers, 1 is for the reason that with the malleability character of platinum and second is that platinum is hypo allergenic, making it safer to use for folks who have high dense in their allergies in metals. As you go on looking for the best engagement ring for your beloved, you are able to go ahead and see all the selections offered from Platinum Engagement Ring Settings and you’d definitely have one great pick as this metal could give wonderful look on any stone that you opt for. The color, durability and elasticity of this metal produced it pretty versatile and far more elegant seeking than other metals accessible. Although, platinum is identified to be a lot higher priced than any other metals available, it is possible to nonetheless say that this is inexpensive given that what platinum could promise is forever beauty and elegance. Platinum is famous with their strength and durability thus engagement rings made of platinum can be an incredibly good investment. You will discover endless selections from this setting; you may have solitaire or maybe micro pave engagement ring as well as other selections that are available just for you. In the event you feel that the diamonds clotted on the platinum engagement ring is not sufficient, you’ll be able to usually personalize it and add extra diamonds on it. If you’re tired of seeing diamonds on engagement rings, you are able to then use any other stones or hard gems to make your engagement ring extra ordinary and unique. There are actually endless solutions and absolutely getting a great piece is not an actual challenging job, as platinum are really versatile. You could match platinum with any stones or gems of your liking. 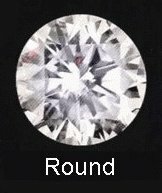 You are able to use diverse sizes of stones, diamonds or gems, you may ask your jeweler to add far more curves and add far more accent on your engagement ring and they would unquestionably be pleased to do that as the job just isn’t too challenging for them to do as platinum is too acquiescent and wonderful. The beauty of platinum can make any stone looks at its best. 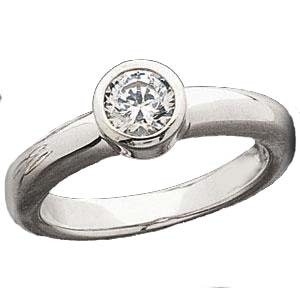 Make your solitaire ring prettier with platinum and show her, her actual worth and make her really feel far more beautiful and far more particular. Do it with any Platinum Engagement Ring Settings available just for your sweetheart. You could see the platinum somewhat highly-priced but utilizing this as an heirloom of your household would make it much less high priced but yet incredibly elegant. Among the characteristic that any Platinum Engagement Ring Settings present would be their timeless designs, style, elegance and beauty. You’ll find too numerous designs to choose from and certainly your girl will have a melted heart as you propose with this setting on your hand. This entry was posted in Diamond rings, Engagement rings, tiffany engagement rings and tagged Bridal, diamond rings, Diamonds, elegance, endless solutions, engagement ring settings, engagement rings, engagements, Family, fashion, general, Home, jewelry, micro pave engagement ring, platinum engagement ring, platinum engagement ring settings, shopping, style, Weddings, women on March 24, 2012 by erika.